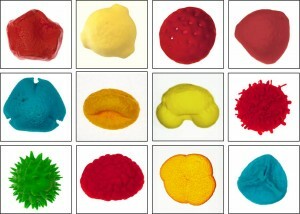 Above: surface-rendered confocal reconstructions of pollen samples (left) and their corresponding 3D printed models (right). Isn’t the World Wide Web a wonderful thing? 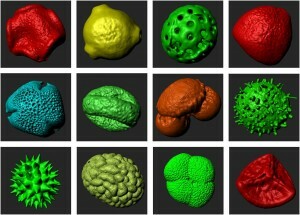 Not so long ago I wrote a short blog explaining how we had developed methodology to convert volume datasets from the confocal microscope into 3D printed models – perfect solid scale replicas of samples the size of a pollen grain etc. Well, shortly afterwards I received an email from someone who had not only read the blog but, serendipitously, wanted to do this very thing! What is more, she was located not a million miles away: in fact, little more than 400 yards down the road from us, working as a researcher within Cardiff University’s School of History, Archeology & Religion. Please excuse the pun, but it really is a small world! Rhiannon Philp is an archaeologist – or palynologist to be precise – someone who studies ancient pollen grains and spores found at archaeological sites. Pollen extracted from archeological digs can be used for radiocarbon dating and for studying past climates and environments by identifying plants growing at the time. Rhiannon is using this information to develop an understanding of prehistoric sea level changes in South Wales as part of the Changing Tides Project. 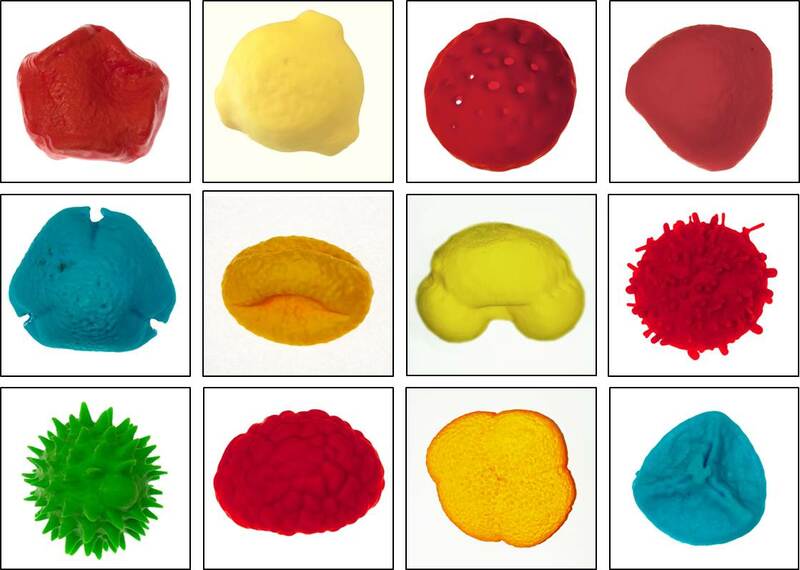 Rhiannon asked if we could generate a reference collection of 3D pollen prints that could be used for teaching and outreach activities as part of a new Archaeology engagement project called Footprints In Time. Indeed, some of her pollen samples were from sites containing both human and animal footprints made over 5000 years ago! You can see some of our results above: on the left are the surface-rendered confocal volume reconstructions and, on the right, their corresponding 3D printed facsimiles – courtesy of the BIOSI 3D printing facility. If you’re at the National Eisteddfod in Abergavenny this week (29th July – 6th August), then please pop by to see Rhiannon’s stall within the Cardiff University tent – all of the models will be on display there, together with a lot more. Any further interest, then please get in touch. This entry was posted in in-focus, news, techniques on August 1, 2016 by Anthony Hayes. 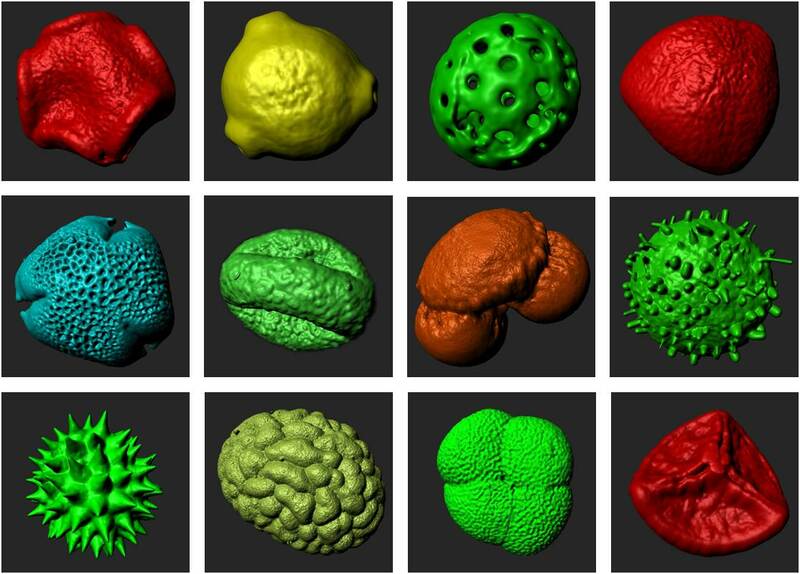 I have been searching for some free 3d printable pollen grains, I wonder if you would be able to direct me to where you found yours or if you would be willing to share the files, we could perhaps come to some arrangement with equipment use in recompense if you had the need.